Channel 4 is channeling the 90s in its new marketing campaign for the second series of comedy show Derry Girls. 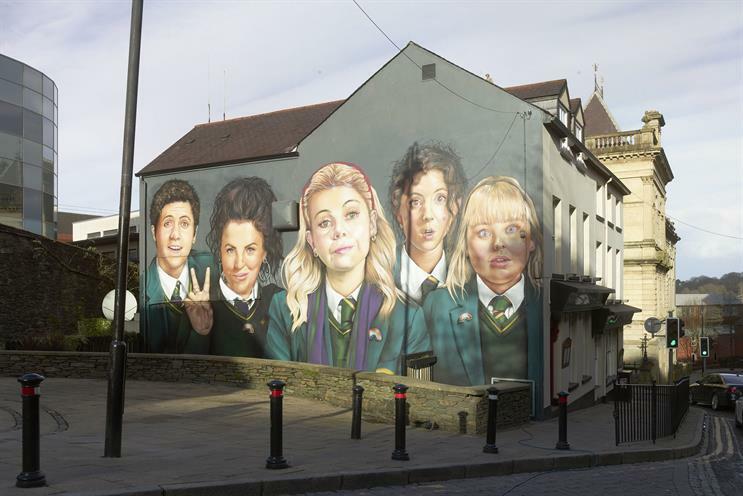 The work is inspired by the murals across Derry, and features the series’ main cast painted on to the entire side of a building in the Northern Ireland city. Alluding to 90s services Fivetext and Teletext, the Channel 4 Instagram will also operate a similarly themed "Derrytext" campaign inspired by the show, which launches on 5 March. The campaign has been created by Caio Turbiani and Raminder Samra at Channel 4’s in-house creative agency 4Creative, and the mural was made by Derry non-profit group UV Arts. The artwork took five days to complete and will be used across the country on posters and press cover wraps. Eoin McLaughlin, creative director at 4Creative, said: "My family are from Derry, so I know first-hand how proud everyone is of the show. By launching the campaign for the second series with a mural in Derry, the city has a fantastic new landmark that recognises the tremendous support the show has received locally and celebrates the city’s culture, its people and their spirit."